There’s a world of periodicals out there, from magazines to newspapers, just waiting for you to explore them. Kindle Fire HD’s color display makes browsing through color magazines especially appealing. Tap Newsstand on the Home page of Kindle Fire HD and then tap the Store button to see several categories of items. 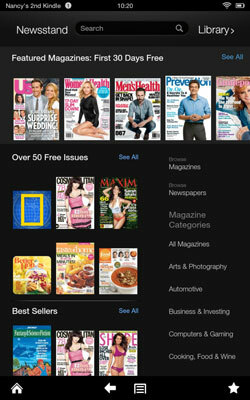 First, there are Featured Magazines with 30-day free trials displayed across the top. You can swipe right to left to scroll through these. Below Free Trials, you see categories such as Best Sellers, Business & Investing, and Entertaining (though the categories might change on a regular basis). You can tap the See All button above any category to see a more complete list of included items. 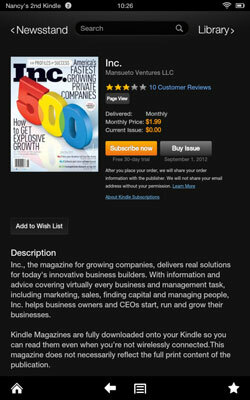 A screen appears showing pricing, a description of the publication, and Subscribe Now and Buy Issue buttons. Tap Subscribe Now or Buy Issue. The button label changes to read Downloading. During the download process you can tap the Cancel button if you change your mind. When the download is complete, the button label changes to Read Now. Tap the Read Now button to open the magazine. Note that the magazine is stored in your Amazon Cloud library where you can read or download it to your Kindle Fire HD via Newsstand at a later time.